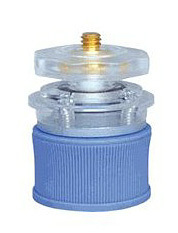 I saw this bottle cap tripod mount today while I was browsing in the Santa Fe Workshops Store. Basically you can convert most filled bottles into a tripod for your compact camera. Half fun. Half useful. Can usually find them for around $10. Thought you might get a kick out it. Also, here's a fun video on how to make one yourself. The author says it only takes 5 minutes. But of course that's once you have all the parts together. Still, seems like a kick. This is great news for photographers. Firefox 3 includes color management. It's not turned on by default, but you can read how to do it on Ron Galbraith's web site. Once set up however, your calibrated images should look great on your browsing labtop or any other computer that uses this setup. I would recommend that pro shooters show their clients how to do this, and if necessary, set it up for them in person. This should improve online photo work for all parties involved. Heading to New Mexico - Any Recommendations? Seems like forever since I've been to New Mexico. But I'm going next week to teach my Photoshop class. I know many of you have visited the area, and I'm hoping you might share some recommendations for taking pictures. So what do you think? What should I not miss in the Santa Fe area? 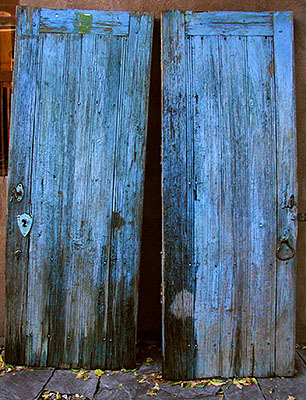 Photo of Blue Doors by Derrick Story. How Much Ink Does the Epson R2400 Use? It's fairly easy to calculate how much your paper costs, but did you ever wonder what you were spending on ink? TDS sponsor Red River Paper has just published a report calculating ink usage for the Epson R2400 and the R1900 printers. Based on their findings, it costs about 90 cents for full ink coverage on a glossy 8x10 print, and about $2.80 for a glossy 13x19. The entire report is interesting. If you're printing with either of these units, you might want to take a look. For more information, visit Cost of Inkjet Printing. "Survey respondents indicated the worst categories in stock photography, in terms of quality and breadth of available imagery, were healthcare (88%), multicultural and diversity lifestyle (86%), senior citizens lifestyle (86%), and consumer technology and products (84%). And don't even get them started on the dearth of photos of multi-ethnic senior citizens in hospital settings playing video games." "It was late on a stormy afternoon in Everglades City, Florida," said Jim Austin. "The wind was howling, and a storm was on the way. Raindrops kissed the hot metal of a car nearby." "I crouched down. 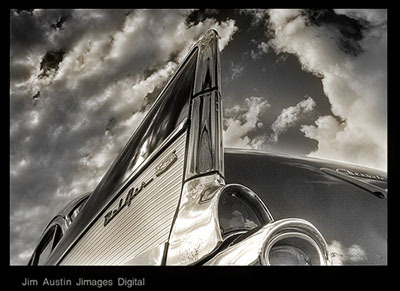 The fins of the car, a 1957 Chevy BelAir, towered above my Canon EF 10-22 lens like a skyscraper. Resting on my stomach so I could gaze upwards, I made three bracketed exposures in color with a Canon DSLR." "All three shots looked well-exposed in the viewfinder. By now the sky had opened and lighting and thunder were rolling in. The image title, "Chevy Above the Levy," goes all the way back to Don McLean's hit song, American Pie." The three framed were shot with a Canon Digital Rebel and 10-22 mm EFS Canon Canon lens (written up in My Favorite Lens on The Digital Story). Processing was done with Photomatix Pro software, available at www.hdrsoft.com. After tone mapping in Photomatix, Photoshop CS 3 and its channel mixer were used to create a high dynamic range of tones for black and white. In the process of making this image, I asked myself what visual elements made for interesting black and white HDR. I came up with shape, and symbolism. Where visual elements of design support a photograph, they expand its symbolic components, and this goes for high dynamic range pictures just as well. For instance, a photograph can act as an analogy. The brilliant photography critic Susan Sontag pointed this out: “what makes something interesting is that it can be seen to be like, or analogous to, something else.” For example, at first glimpse, the fins of the Chevy Bel Air reminded me of a large modern building. FotoMagico was just honored with "Best Mac OS X Leopard Graphics and Media Application Runner-up" at the prestigious Apple Design Awards that recognize technical excellence and outstanding achievement in Mac OS X software design and development. This was FotoMagico's second trip to the podium. In 2006 it received the "Best Mac OS X User Experience Runner-up" award. In its current version 2.2, FotoMagico supports powerful Mac OS X Leopard technologies such as Quick Look and iChat Theater, and it sports a brand-new Sharing Assistant that makes it easy to produce stunning slideshows optimized for DVD, iPod, iPhone, Apple TV and other media devices. Boinx Software, the creators of FotoMagico, are longtime sponsors of The Digital Story. I'm thrilled for them (once again) for this award. Well deserved indeed! 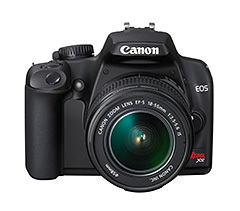 Have you been thinking about buying the Canon Digital Rebel XSi, but can't quite come up with the $850 US? Well, you can save a couple hundred bucks and go with the just-announced Canon Rebel XS/1000D DSLR. After taking a look at Rob Galbraith's post, I must say that there doesn't seem to be a huge amount difference betweek the XS and the XSi. Basically, it's 12 MPs vs 10 MPs, 14 bits vs 12 bits, no spot meter, 3" LCD vs 2.5", and a few other differences. You can dig deeper into the specs by perusing this DP Review Preview. We should see the camera in early July. I still like the XSi a tad better. Audio Only, or Movies Too? I have a question for you. I'm running into more opportunities to capture video when I interview people or am on location. My query is, when I have good video to share, do you want that instead of the weekly audio podcast, or in addition to it? Many people in the publishing business feel that video is a superior medium, or at least cooler, than straight audio. I'm not totally convinced about this. I think consumers use the two different formats different ways. For example, you can listen to a podcast while commuting to work. But it's dangerous to watch video while driving (and not recommended!). On the other hand, I can convey more information via video than audio. This is top of mind for me because I have a good video interview with Photoshop artist Bert Monroy recorded in his studio. I was toying with the idea of publishing it as next week's podcast. Before I do that, however, I wanted to check in with you. So, what's your vote? Video pieces separate from the podcasts, or occasionally instead of? And as always, thanks for your participation! I just read in the Lynda.com newsletter that they released a new installment in their Creative Inspiration series: a profile of Douglas Kirkland. 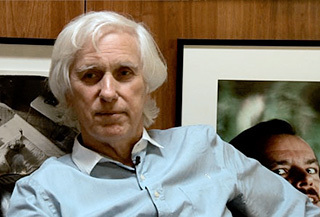 Lynda Weinman writes, "This series of videos features Douglas Kirkland’s photography, from his early career at Look magazine during the golden age of photojournalism in the 60s and 70s to his transition from analog to digital photography in the 90s. His iconic images of Marilyn Monroe, Elizabeth Taylor, Jack Nicholson, and Nicole Kidman, among others, are known all over the world. The piece is 1.25 hours long, and features movies on Douglas’s work, his studio, and his on-location photo shoots. It also includes a presentation showcasing his body of work, a discussion with a group of high school photography students, an interview with Douglas and me, and more." It's a real treat to spend some time with this legendary photographer. I hope you enjoy the videos. While you're there, you may want to check out the free movies for my Digital Photography Principles title.